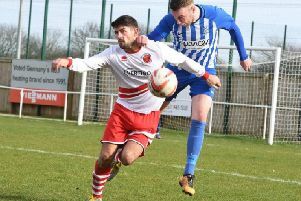 Skegness Town will be looking to make it a double as they travel to Emley tomorrow. The Lilywhites will be keen to keep their recent run of good form going as they travel to face their 17th-placed opponents in the NCEL Division One. Town have won five of their last seven games, with in-form striker James Wroot netting in each of those successes. Indeed, he was on target - along with Daniel Stevens and Will Britton - as Skegness beat Emley 3-0 at the Vertigo Stadium last month. Town currently sit 13th in the table.